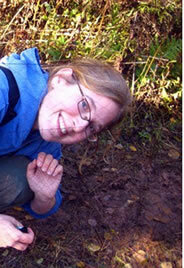 Julie Vasseur is the program manager for the Nature Conservancy of Canada (NCC) in Prince Edward Island. A wildlife conservation technician and biologist, she is passionate about conservation, natural history and the outdoors. Julie has worked for NCC since May 2011 in various capacities and now manages NCC’s securement program in PEI. When she's not in the office, you will find Julie outdoors, hiking along PEI’s beaches and trails or on a downtown patio, enjoying local hospitality and cuisine.